Additional information can be obtained via email. Click on a thumbnail to see full size photos. 001 1925 Ahrens Fox J-S-4 SOLD This vehicle is the finest original Ahrens Fox big six cylinder fire pumper on the planet. The Ahrens Fox trucks were regarded as the Duesenbergs of fire fighting equipment. 691 cid inline six cylinder T head engine. 175" wheelbase, 22 feet 8 inches long. 8 feet tall. Fully equipped and in spectacular running condition. 002 1921 American LaFrance Type 75 Six Cylinder Chain Drive Pumper SOLD Chain drive and completely original with all original equipment. Running great and ready for show and fun.The same model was featured on Jay Leno's Garage (14 minute video). 003 1927 American LaFrance Type 145 Pumper SOLD In service at Reading, Pennsylvania from 1927 to 1963. Six cylinder 130 horsepower. 004 1914 American Underslung Model 644 SOLD This very rare six cylinder, 70 horsepower car is from the Bill Harrah collection, and has recently won an AACA National First Place award at the Hershey Fall meet (2006). There are only three examples of this marquee known to exist. The other two examples are housed at the Nethercutt Museum in Sylmar, California and in the Crawford Museum in Ohio. This car is listed on page 74 in "Motor Cars Of The Golden Past" by Ken Purdy. 005 1935 Auburn Model 8-851 Supercharged Phaeton SOLD This car had a complete body-off show quality restoration. Please refer to our Projects page for detailed restoration photos. 006 1935 Auburn Model 851 Supercharged Phaeton SOLD This 1935 Auburn is a CCCA National First Prize winner, and is categorized as a Category 1 car. It features a Columbia dual ratio rear end and is presented in maroon with a tan leather interior, beige top, chrome head lights, and maroon wire wheels. 007 1912 Autocar Transit Bus SOLD Very rare eight passenger, two cylinder transit bus that is ready for display or ready to transport your friends at shows or swap meets. Hard rubber tires and very solid original body with old repaint. 008 1913 Brock Model 31 Brougham Electric SOLD Model 31 Brougham with 96 inch wheelbase and only 8,195 miles recorded. Made in Cleveland, Ohio. 011 1912 Cadillac Model 30 SOLD First electric start Cadillac. Fully restored and ready to tour.Call for more details. 012 1912 Cadillac Model 30 Four-Passenger Phaeton SOLD Arriving at Shappy's shop in November, 2003. Needs cosmetics and some mechanical work. Cadillac was the first company to offer electric starting in its production line. That makes this vehicle special and sought-after by collectors. 013 1912 Cadillac 1912 Cadillac 5 Passenger Phaeton SOLD >This car has been meticulously restored to perfection and has won "Best Of Show" honors at the New England Cadillac LaSalle Show 2007. Perfect in every aspect. 014 1913 Cadillac Model 30 Five Passenger Phaeton SOLD A full show-quality restoration is nearly complete on this car. We have scheduled it to be shown for the first time on Father's Day 2008, at the New England Cadillac LaSalle show in Portsmouth, Rhode Island. 015 1913 Cadillac Model 30 Touring SOLD Low Mileage "Arizona Car". Nicely restored. 016 1914 Cadillac Model 30 Touring SOLD Two speed rear end. Original paint. New diamond tufted upholstery and top. 018 1915 Cadillac Type 51 Landaulet SOLD "Best of Show" at 2004 New England Cadillac LaSalle show. 019 1917 Cadillac Type 57 Roadster SOLD "Best of Show" at 2003 New England Cadillac LaSalle show. 021 1917 Cadillac Roadster SOLD An AACA National Senior Winner. This 1917 Roadster is flawless in every detail. It also sports five of the very rare and beautiful Rudge Whitworth wire wheels with a rear mounted spare, side curtains, and folding windshield. Like the rest of this superbly restored Cadillac, the original V-8 engine has also been finely tuned, restored, and detailed. 022 1928 Cadillac Convertible Coupe SOLD All Original. Available Soon. One of two. 023 1929 Cadillac Dual Cowl Phaeton SOLD National First Place Winner 2000 Grand Nationals. 024 1930 Cadillac Custom V-16 Hot Rod Roadster by Charles Dimmitt SOLD After a disappointing 107.7 mile per hour showing at the dry lakes at El Mirage, California, Charles Dimmitt transformed his V-16 behemoth into a street-worthy one-of-a-kind roadster in 1948. It was recently discovered in a southern California storage bin, and it is now available here for sale. 4361-S SOLD This car is the nicest 1930 V-16 original club sedan in the world. It is in outstanding original condition throughout, and it is in perfect running condition as well. This CCCA full classic is an ideal candidate for preservation class, showing, or participating in caravans. 026 1930 Cadillac 452-A (V-16) Imperial Limousine SOLD A very solid mostly original (new paint) automobile with completely rebuilt engine. Near completion and ready for sale. 029 1930 Cadillac All Weather Phaeton SOLD Also a National First Place Winner in the 2000 Grand Nationals. 031 1932 Cadillac V-8 Dual Cowl Phaeton SOLD Completely original with only 29,000 miles. 032 1932 Cadillac V-16 Dual Cowl Phaeton SOLD One of only three built. 034 1933 Cadillac V-16 Fisher bodied convertible coupe SOLD Won "Best of Show" at the 2005 New England Cadillac LaSalle show. 035 1933 Cadillac V-16 Seven Passenger (Limo) Sedan SOLD Exterior in excellent original condition. All new interior. 036 1947 Cadillac Convertible Sedan SOLD Fresh show quality restoration has just been completed on this very solid, low mileage car. Call or write for details. 037 1949 Cadillac Model 60 Special SOLD Mostly original and running. 72,000 miles. Long term storage. 038 1949 Cadillac Model 62 Convertible SOLD A very low-mileage original paint, original chrome, excellent running example of the first year Cadillac with overhead valve. We dont think a finer original 1949 Cadillac convertible exists. They are original only once. A new top was recently added. The previous well-known owner always boasted that this car never saw a rain drop. 039 1959 Cadillac Convertible SOLD Low mileage and excellent original quality with original paint, chrome, and upholstery. New brakes, ball joints, top hydraulics, and factory air rebuild. Ready for touring. 040 1959 Cadillac Eldorado Biaritz SOLD Very solid original car that has been recently restored to a very high point quality. The car features all Eldorado options including tri-power carburetion, power steering, power brakes, power seat, power windows, power rear vent windows, power trunk release, air conditioning, and original parade boot. A black beauty with complete new leather interior and top. One of only 1320 produced. 041 1971 Cadillac Eldorado SOLD This car was used in many scenes in the soon to be released movie titled, "Hard Luck" starring Wesley Snipes, Cybill Shepard, and Mario Von Peebles. The movie to be released in May 2006. 042 1929 Chrysler Model 75 Dual Cowl Phaeton SOLD Very solid car needing very little. New upholstery and original chrome. We have located a trunk rack, new shocks and other miscellaneous items. 043 1958 Corvette 289 SOLD 1958 Chevrolet Corvette, complete professional no-expense-spared body-off chassis restoration. Photo Documented and Certified by the NCRS as a regional "Top Flight Award" winner. Complete matching numbers, drivetrain, and 100% original "unhit" body. This pristine example has been refinished in its factory original color of Signet Red / White Coves, and it is one of 756 produced in this combination. Charcoal interior upholstery and white folding soft top compliment this truly amazing Corvette. Powered by the optional 283/270 hp dual quad V8 engine and mated to a 4-speed manual transmission and 3.70 positraction rear axle. Other options include ultra rare power windows (one of 649 produced), AM Wonderbar Radio, heater, courtesy lamp, parking brake alarm, and 6.70 x 15 whitewall tires. This highly sought after and extremely collectible one year only corvette will meet or exceed even the most discriminating collector's standards! Well over $100k spent on the preservation and restoration of this American Icon. One of the finest examples available in today's market. 044 1916 Crane Simplex Torpedo Runabout SOLD Freshly Restored Engine. Body Paint is Mostly Original. 046 1971 Dodge Superbee 440 Cubic Inch SOLD A fresh restoration has recently been completed. This car is ready for show or go. 048 1933 Ford Model 40 V-8 Phaeton SOLD A very rare 4 door phaeton which has been in storage for over forty five years. These cars are bringing over $100,000 in restored condition. This car is a good runner and is priced to sell. 049 1934 Ford Model "B" Racer SOLD Fresh Complete restoration for show or go. 050 1940 Ford Convertible Coupe Deluxe SOLD A complete body-off restoration has just been completed on this car. Call or write for more details. 051 1972 Jaguar XKE Roadster SOLD A low mileage 12 cylinder roadster in superb condition throughout. A well documented automobile with only one previous owner. 052 2004 Lamborghini Gallardo SOLD Low mileage absolutely perfect model. Never has seen rain or winter weather. 054 1939 LaSalle Convertible Coupe SOLD Fully restored with impeccable new paint and chrome. Very low mileage and an excellent runner. 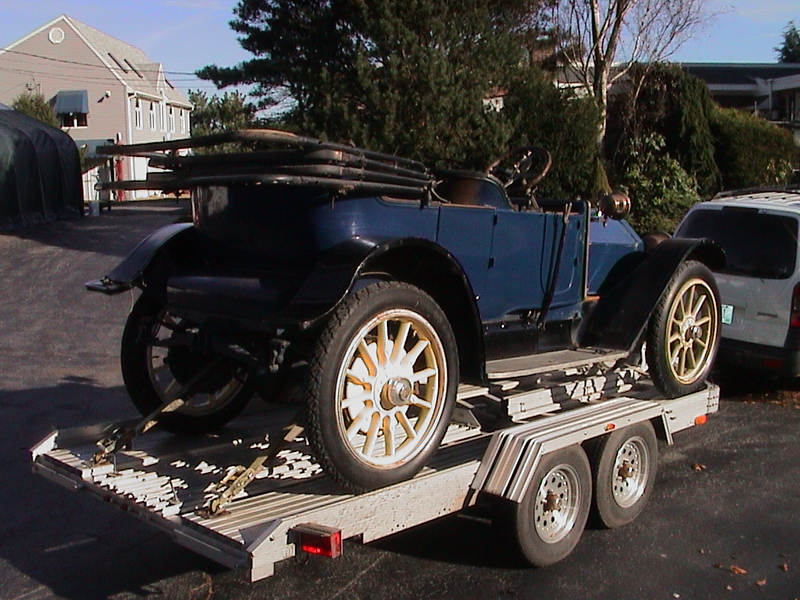 056 1922 Locomobile Roadster SOLD A very low mileage beauty with original paint and nickel plating. Mechanically sound and ready for show or go. New top, tires, and upholstery just completed. Probably the finest original example in the world. 057 1953 Morgan Plus 4 SOLD A beautifully restored early California car. Ready to go. 058 1922 Packard Twin Six Custom By Brunn SOLD This car is the first place winner for best original car in a field of twenty five entries. See video at Hyman Ltd Classic Cars 1922 Packard Twin Six Cape Top at the Pebble Beach Concours d’Elegance 2014. Additional photo at Pebble Beach Concours D´Elegance California (Aug 2014). This car has only 12,000 miles since new. 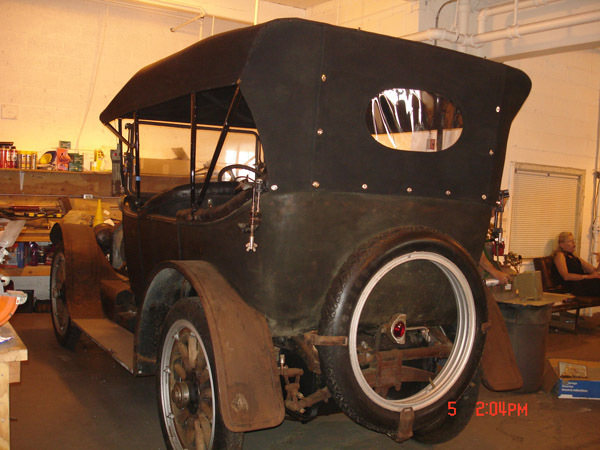 The car was designed by and purchased for Agnes Greer, a very successful and wealthy woman from Dayton, Ohio. The car sports no rear doors which gave Mrs. Greer easier access while wearing her hoop style dresses that were popular attire when attending the opera and other formal events of that era. The Brunn body company of Buffalo, New York is the body builder. Completely original in every aspect and running as it did when new. Call or write for other important details. 059 1929 Packard Model 645 Custom Roadster by Rollston SOLD CCCA "National First Place" winner. This very rare one-of-a-kind automobile was built for the New York Auto Salon, in 1929. 060 1937 Packard Henney Hearse SOLD A very solid original car that needs restoring. Seems to be very complete. 061 1938 Packard Landaulet V-12 by Rollston SOLD This car was custom built by Rollston of New York for Miss Doris Duke "The tobacco heiress" and then "richest girl in the world". A one of a kind breath taking rarity with complete restoration information available. 062 1939 Packard 1708 Twelve Cylinder SOLD This car was used in Hollywood, California as the filming studio's special limo. Soft top and divider window. Only 446 Twelve cylinder cars were produced by Packard, in 1939. 063 1939 Packard 1700 Series SOLD Twelve cylinder, 144-inch wheelbase, 49,000 original miles. 064 1942 Packard Model 120 Convertible Coupe SOLD Rebuilt engine and transmission with overdrive, rebuilt vacuum top, body work complete. Beautiful original chrome. 065 1933 Pierce Arrow Model 1236 Convertible SOLD This model broke the land speed record, in 1933. 066 1914 Pope Hartford Portola Roadster SOLD Complete three year show restoration recently completed on this very rare car. Engine work done at Lab Threads of Connecticut. 067 1920 ReVere Duesenberg ReVere Four Passenger Speedster SOLD 106 Horsepower Walking-Beam Duesenberg engine. Former owner Adolf Munson was designer of the ReVere Duesenberg housed in Logansport, Indiana for 65 years before it was placed in the Rockefeller Museum. Currently, only four known to exist. 068 1922 Rolls Royce Silver Ghost Display Engine and Transmission SOLD This is a completely rebuilt running engine which includes transmission, Waterford E-06 magneto,manifolds,water cooled carburetor,instrument gauges, radiator, nickel shell, mascot and much more. In 1922 Only 230 cars were built and all were custom made to order. 069 1927 Rolls Royce Springfield Piccadilly Roadster SOLD New restoration of the most highly regarded body style ever placed on a Rolls Royce chassis because of its perfect body lines. Write for more technical information. 070 1912 Speedwell Model H Speedcar SOLD Winner of the 2009 Concours d'eleganse. This very rare and freshly restored 50 horsepower brass-era beauty is now available for sale. Former owners include opera singer James Melton, Winthrop Rockefeller, and Bill Harrah. More details and photos available on request. 071 1918 Stutz Bearcat SOLD Call or write for details. 072 1920 Stutz Bearcat SOLD Fully restored to show quality condition. Excellent running order. 073 1929 Stutz Blackhawk SOLD Original paint and interior and very complete running car. Call or write for details. 075 1952 Ariel Square Four / With Dusting Side Car Mark 1 (1000CC) SOLD Very nice original good running ex Australian bike. Register TM 373. 076 1939 BSA with Murphy Side Car M-20 500CC (engine #23425) SOLD Ex Australia military. Good running motorcycle with Girder forks. Has Murphy 1 1/2 sidecar. 077 1934 Crocker Speedway Racer SOLD Very unusual to find very rare specimen of this bike in original condition. 078 1910 Flying Merkel Single SOLD Another piece of cycling history in its original and pristine condition. Well running and complete. 079 1911 Flying Merkel V-Twin Board Track Racer SOLD Beautifully restored to "zero" miles. 081 1914 Flying Merkel Twin SOLD Total restoration of the most advanced style Merkel made. A very rare Model 473 7hp chain drive version. 082 1905 FN Type A Four-Cylinder Motorcycle SOLD This example was purchased in 2000 from Belgium, and it is undergoing a painstaking restoration. It has been part of the OQuinn Collection since 2006, benefiting from proper storage. 083 1914 Harley Davidson Twin SOLD In storage for over fifty Years. Runs like new. 084 1918 Harley Davidson Twin Model J Electric SOLD A complete and exhaustive mechanical restoration of the engine and working parts of this motorcycle have just been completed. This is one of the best running pieces in the collection. Ready for show and go. 085 1947 Harley Davidson WL (WL5319) SOLD Red and black six year old restoration. Good running. 087 1927 Henderson Four Cylinder SOLD One hundred percent complete and running. Many extra parts included. 088 1907 Indian Single SOLD Very well documented provenance. All genuine real parts. No reproduction parts here. Has been in storage for the past 65 years. Original extra gas tank available. 089 1912 Indian V-Twin SOLD Restored in mid-seventies. Not ridden since. 090 1914 Indian Twin SOLD Fully restored to show winning status with no expense spared. 092 1917 Indian Power Plus SOLD A fresh show quality restoration has just been completed. 093 1918 Indian Model "O" Opposed (Vertical) Engine SOLD Mostly original with painted tank. Here is your chance to own a piece of motorcycle history at an affordable price. We have done nothing to the bike yet and are offering it for sale now at $12,500! 096 1951 Indian Chief SOLD A very beautiful restoration was completed on this low mileage "Roadmaster" twin. 097 1913 Pope Single SOLD A fresh and thorough restoration has just been completed on this very rare motorcycle available for purchase. Call or email for more detailed information. 098 1915 Pope Model R Twin SOLD Former E. J. Cole specimen correctly restored. 099 1901 Thomas 1 1/2 Horsepower SOLD The first American production motorcycle made. 11.66 cubic inch, 2 1/2 inch stroke, 2 7/16 bore. Made in Buffalo, New York by the E. R. Thomas Co. Only eight are known to exist. A professional museum quality restoration was just completed on this fine gem. Absolutely awesome! 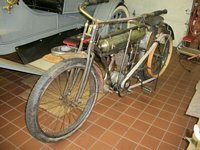 100 1910 Yale Single SOLD A very rare good running all original early motorcycle.